Flying Experience Day – The Ultimate Gift! Never flown an ultralight aircraft before? Looking for a gift flight for a loved one? Thinking about starting flying lessons? The answer is one of Cloudbase’s flying experiences! What’s Included With Your Flying Lesson? You will sit in the front seat of a CT microlight aircraft (pictured above) as we take-off from Redhill aerodrome and begin the trip of a lifetime. 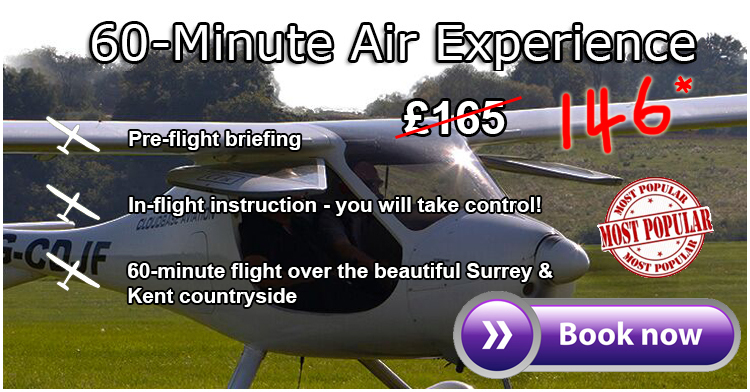 Take control under the instruction of one of our experienced pilots or simply sit back and enjoy the view! There are 2 different flying presents to choose from. 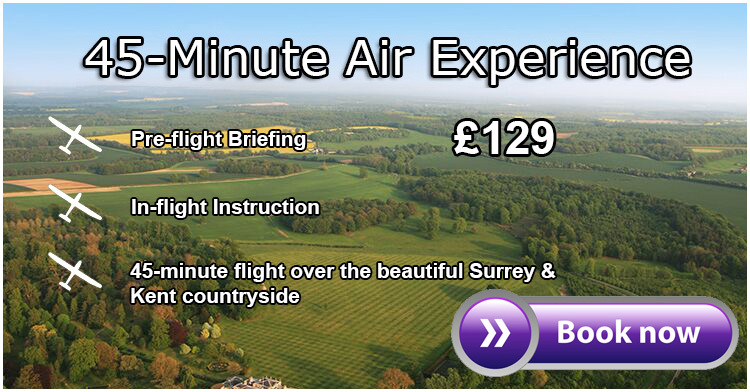 Once you’ve decided, click <Book now> so we can arrange a flight for you, or a loved one, on a day when the weather looks great! So What Do You Get From Your Flying day? Our flying adventures are a chance for you to feel the thrill of travelling at over 130mph overhead the Surrey, Sussex and Kent countryside! We will try and tailor your flying present to suit you. Live closeby? We should be able to give you an aerial view of your house. Interested more in the flying? Then our instructor will give you the controls and guide you through some basic maneuvers. If you just want to soak up the sights; sit back and enjoy the flight! If you do decide to carry on and start learning to fly, the time spent on your introductory flight can be logged and counts as part of your training. If you book your next lesson after we land, we will give you a FREE logbook to get your training off to a ‘flying’ start! I'm really nervous about flying, is a Cloudbase flight a good thing to do? We have flown many nervous passengers in the past 25 years. Our friendly and skilled instructors will put you at ease straight away, explaining everything that will happen on the day. The aircraft are very modern and safe, and we are sure that as soon as you are up in the are, you will relax and take in the breathtaking scenery. If you decide you do not want to take the flight at any point, we will refund the whole cost of the day. The air experience day will count as 1 hour towards the licence, as usually we cover the first lesson in the syllabus – effects of controls. Just let the instructor know your ambition and the flight will be geared towards instruction as opposed to just a leisure flight. Is there any age limits on people who can fly? A day with Cloudbase is action-packed and very rewarding so book one now online or ring us on 01737 474 118.